It was only a matter of time before I created one of these threads...Please post any information related to new regulations on Banks and or other financila institutions (i.e. HF/PE). I will go through other threads to see if I can consolidate some random postings. Feb. 2 (Bloomberg) -- Former Federal Reserve Chairman Paul Volcker plans to tell the Senate Banking Committee today that hedge funds and private-equity funds should be allowed to both profit and fail, without any expectation of government support. “Managements, stockholders or partners would be at risk, able to profit handsomely or to fail entirely, as appropriate in a competitive free-enterprise system,” Volcker says in remarks prepared for testimony before the panel. The 82-year-old former Fed chairman defends President Barack Obama’s Jan. 21 proposal to limit the size and trading activities of banks, saying it would reduce risk in the financial system while leaving banks with a “wide range” of profitable services to offer. The restrictions are part of a larger effort to deal with future expectations for bailouts, Volcker said. “Hedge funds, private-equity funds, and trading activities unrelated to customer needs and continuing banking relationships should stand on their own, without the subsidies implied by public support for depository institutions,” Volcker says in the text of the speech obtained by Bloomberg News. Volcker draws distinctions among three groups of institutions: hedge funds and private equity funds, which he says aren’t entitled to taxpayer support; commercial banks that take federally insured deposits; and large, interconnected firms whose failure could pose a threat to the broader economy. The former central banker is scheduled to begin his testimony at 2:30 p.m. in Washington. Banks carrying out “essential services” deserve a “safety net,” he says. At the same time, Volcker calls for resolution authority to take control of large, failing financial institutions, in a process that would amount to “euthanasia, not a rescue.” He also asks lawmakers to strengthen regulation of financial firms by imposing stricter requirements for capital and liquidity. “What we plainly need are authority and methods to minimize the occurrence of those failures that threaten the basic fabric of financial markets,” he said. Lawmakers are considering measures to overhaul regulation of the financial system to avoid a repeat of the crisis that led to taxpayer-funded bailouts of firms including American International Group Inc., Citigroup Inc. and Bank of America Corp. The Standard & Poor’s 500 Financials Index has jumped more than 137 percent since March 6 as the financial system healed. Volcker is among a group of Washington policy makers offering ideas to eliminate the too-big-to-fail policy that led the U.S. government to prop up large firms. Financial regulators have said they lack the authority to unwind some large failing financial firms in an orderly way. The House approved financial-regulatory overhaul legislation in December that would give supervisors the authority to disassemble healthy, well-capitalized financial firms whose size threatens the economy. Senators John McCain, an Arizona Republican, and Maria Cantwell, a Washington Democrat, in December proposed legislation to reinstate the Depression-era Glass-Steagall Act that split commercial and investment banking. Obama’s proposal, which the president named the “Volcker Rule,” would prohibit banks from owning, investing in or sponsoring hedge funds and private equity funds, and from running proprietary trading operations for their own profit. The plan is based on an idea recommended by Volcker and builds on a proposal Obama sent to Congress in June for overhauling U.S. rules overseeing Wall Street. A bank that trades for its own account “will almost inevitably find itself, consciously or inadvertently, acting at cross purposes to the interests of an unrelated commercial customer of a bank,” he says. “I am not so naive as to think that all potential conflicts can or should be expunged from banking or other businesses,” Volcker says. “Neither am I so naive as to think that, even with the best efforts of boards and management, so- called Chinese Walls can remain impermeable against the pressures to seek maximum profit and personal remuneration,” he says, referring to internal barriers firms may use to avert conflicts. The breakthrough did not come until early Saturday morning at a closed-door meeting here in the Swiss Alps. A group of the world’s top banking chiefs and regulators, some nursing hangovers after a late night of party-hopping, finally started making some progress over financial reform at the World Economic Forum’s annual meeting. For the previous few days, bankers and regulators had been shouting past one another over the Volcker Rule — President Obama’s surprising proposal to prevent commercial banks from engaging in proprietary trading and limiting their overall size — and what it would mean to the global banking system. 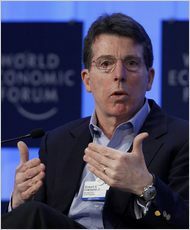 The bankers had gone on the offensive, with Bob Diamond, chief executive of Barclays Capital, taking the lead. The more contentious discussions were around Mr. Obama’s plan to restrict proprietary trading. One hedge fund manager described the proposed rule by using more four-letter words in one sentence — as nouns and verbs — than I thought possible. The biggest debate surrounded exactly how proprietary trading was going to be defined. Indeed, in the past week and half, banks have tried to estimate their proprietary trading, with most banks suggesting that it is a minuscule part of their business. JPMorgan Chase, Morgan Stanley and others estimated it at less than 2 percent of their business; Goldman Sachs said it was under 10 percent. As the week wore on, factions of bankers, politicians and regulators developed with each side blaming the other for making reform even harder to achieve. And so perhaps it was surprising that by Saturday, after many of the biggest names had already flown back in their private jets (yes, many took private jets, though it is worth noting that Mr. Diamond did not, nor did George Soros nor Eric Schmidt of Google, for those of you keeping score), the beginning of an agreement started coming together. The credit, according to some in the room, goes to the chairman of the Financial Services Authority, Adair Turner. He suggested that there needn’t be an outright ban on proprietary trading — defined in the widest terms possible, including trades that relate to clients — but that there should be a cap on the percentage of the business that it represented. It appeared to be a fair compromise that many could agree on. But first, it needed someone’s blessing. A call was placed to Paul Volcker later that day, according to one participant. Now let’s hope they stick to it when the hangovers wear off. Feb. 5 (Bloomberg) -- Senate Democrats Barbara Boxer and James Webb proposed a 50 percent tax on bonuses of more than $400,000 at financial firms including Goldman Sachs Group Inc.
and Bank of America Corp. that received U.S. bailout money. Boxer of California and Webb of Virginia introduced legislation to put a one-time levy on the bonuses of employees at banks that took at least $5 billion from the Troubled Asset Relief Program, the senators said yesterday at a Washington news conference. The bill would affect 13 firms and could raise $10 billion to help cut the federal deficit, Boxer said. "It’s outrageous that many of these companies are doling out millions of dollars in bonuses while the rest of America feels the pain of reckless decisions," said Boxer, who is seeking re-election in November. American International Group Inc., Citigroup Inc., JPMorgan Chase & Co. and Morgan Stanley are among the companies that would be affected, Boxer said. Lawmakers are taking aim at financial firms in response to public anger over Wall Street’s role in the global financial crisis. President Barack Obama said last month he wants to tax as many as 50 financial firms with assets of more than $50 billion to recoup U.S. bailout money. The administration hasn’t backed levies on individual bonuses and the Senate has been reluctant to expand government’s role in compensation. $44.7 billion. The total was less than the $46.1 billion five analysts expected in January and almost $10 billion less than what some analysts estimated in October. After much anticipation forex traders and brokerages in the United States can finally breathe a sigh of relief. On August 30, 2010, the Commodity Futures Trading Commission (“CFTC” or “Commission”) published its final rules (“Final Rules”) on Over-the-counter Retail Foreign Currency transactions (“Forex”). This is ground breaking news for the industry as brokers and money managers were previously able to operate within these markets with little to no oversight - no longer. What exactly do these new regulations mean for forex introducing brokers, trading advisers, and fund managers? Are the Final Rules as devastating to the industry as the proposed rules, published by the CFTC in January of this year, were thought to be? Let’s find out. The following information was taken directly from the CFTC’s website and addresses the three largest areas of concern included within the original forex rule proposal. The Final Rules, including the below requirements, come into effect on October 18, 2010. Entities that wish to serve as counterparties to off-exchange retail forex transactions – and that are not among the otherwise regulated entities enumerated in the Commodity Exchange Act (“CEA”) – will have to register with the CFTC as either futures commission merchants (“FCMs”) or retail foreign exchange dealers (“RFEDs”). Entities that wish to engage in retail forex transactions, but would be primarily or substantially involved in on-exchange business, will be required to register as FCMs. And, finally, entities that will serve primarily as retail forex counterparties will be required to register as RFEDs. Additionally, for the first time, entities other than RFEDs and FCMs that intermediate retail forex transactions will be required to register with the CFTC, as applicable, as introducing brokers (“IBs”), commodity trading advisors (“CTAs”), commodity pool operators (“CPOs”) or associated persons (“APs”) of such entities. The proposed 10 to 1 leverage restriction has been replaced with a mechanism whereby the Commission sets parameters (the release specifies a minimum 2 percent security deposit in the case of major currencies and 5 percent of the notional value of the transaction for all other currencies) and periodically reviews the appropriateness of those parameters The National Futures Association(“NFA”) is authorized to set specific security deposit levels within those parameters, and is required to review periodically and adjust as necessary both the particular security deposit levels and the designation of which currencies are “major” currencies, in light of such factors as changes in volatility. The proposed requirement that a person who registers as an IB to introduce retail forex accounts must be guaranteed by a registered FCM or RFED (and that the IB could be guaranteed by only one FCM or RFED) has been replaced with the same requirement that currently applies to IBs who introduce futures and commodity interest accounts. A forex IB may choose either to meet the minimum net capital requirements applicable to futures and commodity options IBs, or to enter into a guarantee agreement with an FCM or an RFED. 3) Leverage will have maximum boundaries of 50:1 on major currency pairs and 20:1 on exotic currency pairs. These parameters will, however, be monitored by the CFTC, as well as NFA, and from time to time may be lower than these prescribed levels. Bloomberg--U.S. Securities and Exchange Commission Chairman Mary Schapiro said her agency may impose new rules on high-frequency traders after lawmakers and investors questioned whether market participants who execute thousands of transactions in seconds sparked the May 6 plunge. Regulators are under pressure to show they have a grip on markets increasingly dominated by electronic trading after the May 6 selloff erased $862 billion from the value of U.S. equities in less than 20 minutes. A preliminary report published by the SEC and the Commodity Futures Trading Commission in May found liquidity dried up when it was needed most. Lawmakers such as U.S. Senator Charles Schumer, a New York Democrat, have argued that high-frequency traders pulled out because they face no obligation as market makers to buy and sell shares during periods of market stress. The SEC is investigating whether the rapid-fire submission of stock orders that are then canceled represents an effort to manipulate markets, Schapiro said. Many high-frequency traders cancel at least 90 percent of their orders, she said. One step to address the surge in canceled orders would be requiring a “minimum time in force for quotations,” Schapiro said. “There may, of course, be justifiable explanations for many canceled orders to reflect changing market conditions,” she said. The SEC has already taken steps to address the May 6 crash, including halts on trading of stocks with price moves of at least 10 percent in five minutes. The agency may also eliminate so-called stub quotes, which are prices far from current trading values. Stub quotes exist to fulfill an obligation some brokers have to buy and sell stock. When they were triggered on May 6, some stocks traded for pennies.